As a result of the discussion around this thread, I’m going to launch the first-ever Webcomics.com Comics Event: Webcomics.com Halloween! Create a Halloween-themed illustration or standalone comic and post it here. I will create a special Halloween page on this site for all of the participants. All participants will get a link back to their own site. We’ll promote the page together, and hopefully generate a little traffic along the way. You can post on this site the same way you would post on your own WordPress-based website! All posts have to be reviewed and approved by a Webcomics.com moderator. And the site reserves the right to edit any submitted content. On the dropdown menubar, click Comics. Please use the Set Feature Image option (it’s in the right-hand column) to upload your comic. 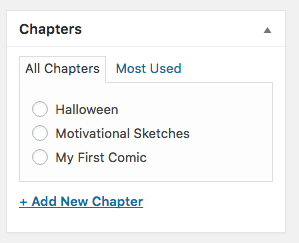 Be sure to select the Halloween chapter tag (see image to the right). You can even add a headline and text. In the text, you can link to your comic. No explicit content (text or images) will be approved. I will accept pieces right up until the 31st — but I can’t guarantee that submissions made past the 29th will be approved/published in time. There’s no page limit for people submitting multiple-page comics.